George Cassidy Ladder 108 circa 1960's. From the collection of James McEnaney James McEnaneyformer member of Ladder 108. Brooklyn Ladder 108's Old International Tractor. 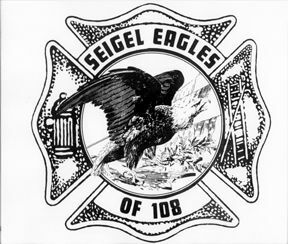 Mail call: I have decided to add a page or link to the Ladder 108 page to include some of the e-mail that I receive and share it with all who want to read it. 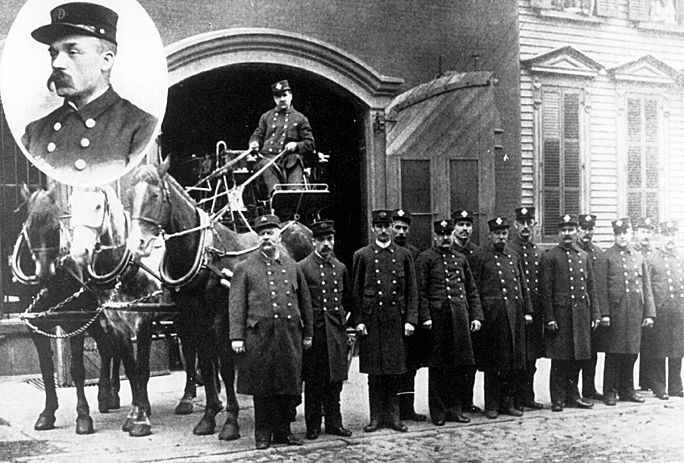 In 1887, Ladder Company 108 started out as Ladder 8 in the Brooklyn Fire Department. It became part of the Fire Department of the City of New York and was redesignated as Ladder 58 on October 1, 1899. In 1913 it bcame Ladder 108. Wm Tracy (up in the seat) Back row: Joseph Davis, Bernard A. Matschke, Chas. E. Fernald, Francis Bowers and Philip Frey. Front row. John F. Fanning, District Foreman, John J. Fee - Foreman (shown in the oval picture too), Henry Wackerman - asst. Foreman, Francis McLarney, Jacob Lehman, Geo. Lampert, Quincy J. Kraft, Richard S. Wood. I worked with Glenn Tracy last night and I asked him how many Tracy's were assigned to Lad. 108. He said that he is sure of four (Him, His father, his grandfather and his great grandfather) but his grandmother told him that he (Glenn) was the fifth to be assigned to the company. Glenn says that his grandmother was old when she told him he was the fifth so he's not sure. Glenn thinks that the Tracy depicted in the photo was is great grandfather but he can't be sure. Capt. Tom Fried, Ladder 108. History: Ladder 108 Ladder Co. 108, now quartered at 187 Union Ave., Williamsburg, Brooklyn, began life as Hook & Ladder Co. 8 in the old City of Brooklyn Fire Department at 112 Siegel Street near Graham Avenue on November 30, 1887. 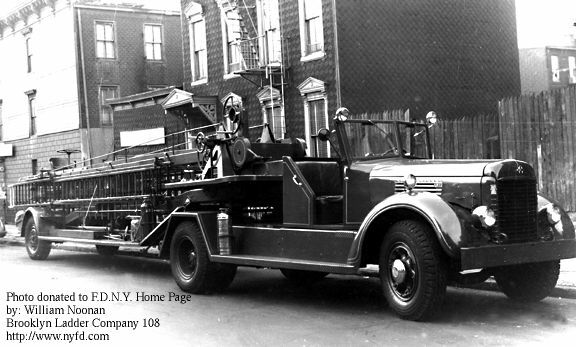 During this time, to be distinctive, the Brooklyn Fire Department used two-tone green on their apparatus, while F.D.N.Y. apparatus was red. Green continued to be used until consolidation of the five bouroughs in 1898. 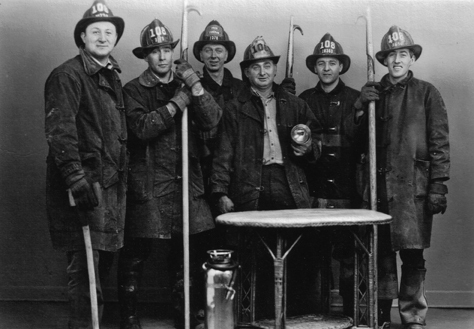 On January 1, 1898, Ladder Company became part of the Fire Department of the City of New York. It was renumbered as Ladder Company 58 on October 1, 1899. It was not until January 1, 1913, that Ladder 58 was renumbered as Ladder Company 108. In the 110 years of Ladder 108's existence, two members lost their lives in the line of duty. A fire in Queens on March 2, 1905, took the life of Lt. George McGeary and 27 years later on May 2, 1932, Firefighter Joseph LaGrange was killed when Ladder 108 and Engine 213 collided responding to a false alarm and Firefighter LaGrange was thrown to the street. 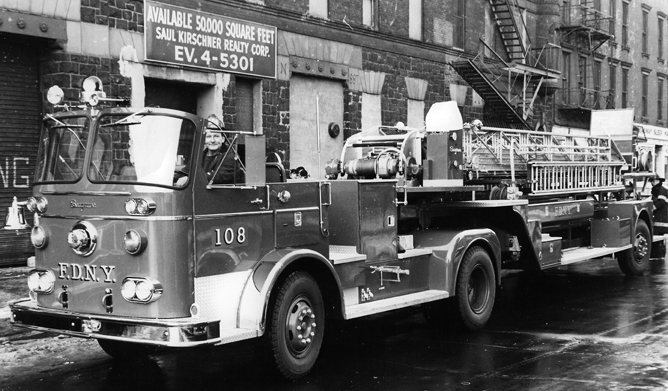 Ladder 108's tenure at 112 Siegel Street lasted 84 years and on August 9, 1971, 108 truck moved to a new firehouse at 187 Union Avenue and is still quartered there.